Use playing cards to teach math. Make math fun by playing games that teach math, not teaching math by playing games. The difference is subtle. Required: several decks of "math cards". I told you, you don’t need to buy expensive manipulatives or go rush out and look for them at your school supply store, Amazon or ebay, or bother ordering them through your favorite catalog. "Math cards" are just "normal", poker-style playing cards, for a lot of games you want the jack, queen, king, and jokers removed but when you use them to teach multiplication put these cards back in and make the ace 11, the jack 12, the queen 13, and the king 14. Remember at Crewton Ramone's house of math we learn how to multiply all the way to 20 x 20. You can assign whatever values you want. Some times I leave the jokers in and the students can make up any value they desire. With little kids playing war this is often "a billion." When you play multiplication or fractions games they actually have to calculate the numbers so they are more reasonable with their designations. You can have one deck of "math cards" per player or split a deck or two up and use the cards over and over again or just deal one deck to however many players you have. If you are just using 1 to 10, you get 40 cards (no face cards or jokers), so a single game of Addition War lets your students work 20 problems, and they hear their opponents work 20 more. Most children will rarely want to stop after just once or even twice through the deck. I recommend you stop before they want to and go on to something else. "Always leave them wanting more." Check out my blog for actual tutoring sessions these games are a part of, you'll see in an hour that this is just one of the many activities we do. Basic War: The classic kids card game you already know how to play. Each player turns one card face up. The player with the greatest number wins the battle, placing their own and all their winnings into their pile. Whenever there is a tie, ALL the players battle: each player plays 2 cards face down, then a new card face up. As each card is laid down the players say: I. Declare. WAR! (War said with a little gusto on the face up card). The highest of the cards will capture everything on the table. Since all the players join in, someone who had a low card in the initial skirmish may ultimately win the battle and stay in the game. If there is another tie, repeat the 2-down-1-up battle pattern until someone breaks the tie. The player who wins the battle wins all the cards played in that turn. I've seen ties three or four times in a row and the kids get pretty excited after the second time. It's fun. Even older students in high school can end up "getting into it." Th object of the games besides learning math facts and having fun is to end up with all the cards...When the players have played the entire deck, count the cards. Whoever has the most cards wins. If you want to keep playing, shuffle each players winnings pile and play again you can tell who has the most cards because the other players will run out of cards and you can stop there. This will make them want to play more especially if one of the other players was making a comeback in the second round, you can also play until someone obviously has the most cards and the other players stop on their own. Search the internet you will find many, many variations and even special cards designed to play these games in a slightly more complex fashion. I find plain ol' playing cards work just fine. For most of the following variations, the 2-down-1-up battle pattern becomes 2-down-2-up because it takes two p card to play. Add or subtract the two face up cards and largest sum wins, or take the two cards or multiply them (this is the most common way I play: for multiplication facts)...with subtraction make it so the smallest number wins and you might end up going negative. Make sure they have a little experience with negative numbers first. Make up your own rules and have fun. Turn up two or three cards and create a 2-digit or 3-digit number, great for place value students quickly learn to put the highest card first. You can also play low ball where the lowest number wins to make it more interesting. Players turn up two cards for each turn. The highest sum wins. Turn up three (or four) cards for each turn and then add them together. 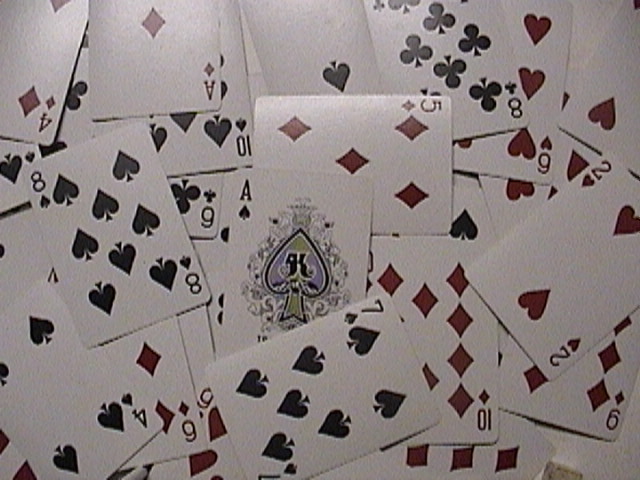 Players turn up two cards and subtract the smaller number from the larger. This time, the greatest difference wins the battle. (This makes it so there are no negatives.) You can play highest or lowest, or whatever: make up your own rules just make sure everybody understands how to "win" and have fun. Turn up two cards and multiply them together. This is the most common game after just regular war and addition facts war. As students learn their multiplication facts, they need extra practice on the hard-to-remember ones like 7 x 8 and 4 x 7. With a normal deck of cards, they'll turn up too many simple problems like 1 x 9 or 2 x 7. So for a greater challenge, all the cards and write down what they equal so everybody can see and remember it, aces = 11's, deuces = 12's, jacks = 13's, kings = 15 etc so you get practice from 3 to 15...you can also make the numbers higher. A deuce could be 20 for example and a queen 17...make up our own rules or let the students choose the values. Turn up three (or four) cards and multiply. Players turn up two cards one over the other making a fraction, to start you may want to use the smaller card as the numerator. Greatest fraction wins. Later you can just have the first card be the numerator and the second card be the denominator improper fractions are fun and easy too. Turn up two cards and make a fraction, always using the larger card as the numerator. Greatest number wins. Black cards are positive numbers; red cards are negative or the opposite (get it?). The greatest sum wins. Players turn up three cards and may do whatever math operations they choose with the cards. The highest or lowest answer wins. Black cards are positive numbers; red cards are negative numbers or the opposite. Players turn up four cards (or five) and may do whatever math operation they like with the numbers. The highest or lowest answer wins. Black cards are positive numbers; red cards are negative numbers or the opposite. Players turn up three cards (or four, or five) and may do whatever math operation they want with the numbers. The answer with the lowest absolute value (closest to zero) wins. Look at all the Math concepts the students get "just from playing cards": greater-than/less-than, addition, subtraction, multiplication, division, fractions, negative numbers, absolute value, and even multi-step problem solving. Deal 7 cards to two or more players and play "Go Fish" for tens, nines, elevens etc. Reinforce addends. The person who gets rid of all their cards first wins, or the person with the most addends wins. Also check out this page, Games and Activities. It contains a PDF of the Series A Games and Activities Manual, pages 10, 14 and 15 show how to use playing cards in conjunction with base ten blocks for some more math fun. Give the pdf a few seconds to load. Go to Eat Sleep Math.